I'm a big fan of the Atlanta Braves. Last night their TV broadcasters, were having a discussion about which league is stronger, the American League or the National League. The age old adage is that pitching wins, but Joe Simpson gave a pretty strong argument in favor of hitting and thus, that the American League is the "stronger" league. Interleague play, which started in 1997, is a good place to determine how the leagues match up. In 2004, they were separated by only one game, but since then, the American League has been winning by wide margins. This fact, in and of itself, does not support Joe Simpson's argument. I extend the research a bit further by comparing ERA and batting average. I used Tableau to analyze the data. On the top, it's clear that the American League has had a higher ERA and a higher batting average every year since 1985. I don't think it's a stretch then to say these charts in conjunction with the interleague comparison indicate that hitting is more important to winning than ERA, and Joe's argument is now supported. The scatter plot on the bottom left again shows that the American League typically has a higher ERA and batting average. This is really just the two line graphs compared to each other. Finally, the scatter plot on the bottom right extends the first scatter plot to include the league that won the World Series. I find it interesting that when the American League wins the World Series, they win it because of hitting, whereas when the National League wins the World Series it's due to pitching. Another nice visualization Andy. I do have a question. 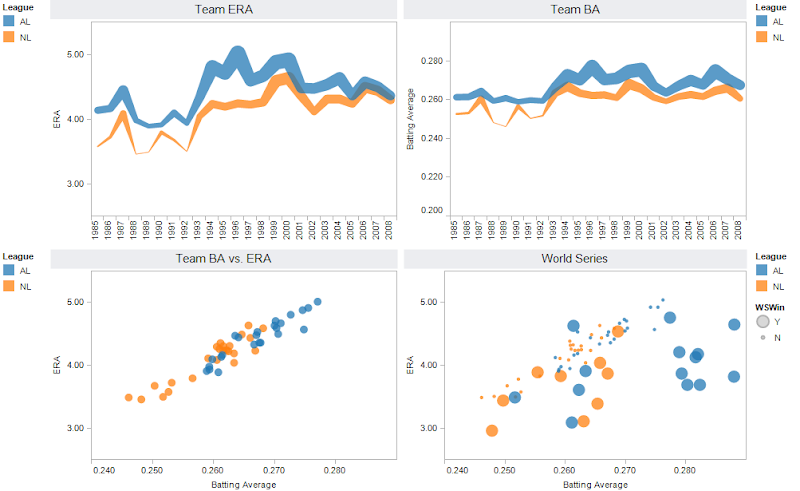 What does the line thickness variation represent in the Team ERA and Team BA time series charts? The thickness of the line represents the ERA or batting average. I probably don't need it and it doesn't add much value, but I put it on there to emphasize the variations year to year. Also, when I think of a good ERA, I think of small numbers, hence the thin line. Thanks for the comments. Great discussion. Hi Andy, could you upload your dataset(s) to http://visualizefree.com so I can create a couple different views? After uploading it, change the Sharing Mode to Protected, and copy the URL. Thanks!